Yesterday Qantas revealed a striking new special livery for a brand new 787-9 Dreamliner being delivered to the airline. Comprised of approximately 5,000 dots (get counting! ), the new design is striking both from near and afar. The new livery features the work of the late Northern Territory artist and senior Anmatyerre woman, Emily Kame Kngwarreye. It is based on her 1991 painting, Yam Dreaming and has been adapted for the aircraft by leading Indigenous owned design studio Balarinji. Managing Director of Balarinji Ros Moriarty said the design studio was honoured to continue its 20-year partnership with Qantas to support the place of Aboriginal design in Australia’s global identity. Balarinji also worked with Qantas on the four other designs that have graced their routes around the world (of which today only one other remains in service). Impressively, a team of more than 60 graphic designers, engineers and painters at Boeing’s Seattle facility worked with Balarinji to install the design onto the aircraft, taking more than ten days to complete and two years in planning. The result is beautiful, striking, and flies in the face of the ‘Eurowhite’ designs gracing the skies globally. Beautiful! And uniquely Australian. Congratulations to QANTAS. What the hell is that below the cockpit window? 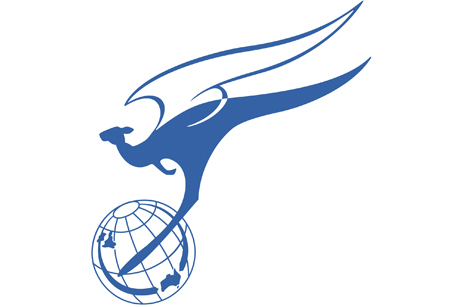 That’s the original winged-kangaroo logo that dates back to the late 1940’s and QANTAS’ Constellations (and perhaps even earlier than that). The current kangaroo logo has over the years morphed into such a fluid shape that it’s a bit difficult to tell what it’s supposed to be. Beautiful design. So nice to do something with a specific cultural context. So many airlines’ color schemes are vaguely international and largely interchangeable. @kenneth – was it always in a circle? @Tim – No, it wasn’t always in a circle. Looking through some of my long-saved memorabilia I see that on some promotional pieces from QANTAS’ early days of operating the 747 the logo was encircled, but when applied to the company’s aircraft – usually on the tail – the winged-kangaroo was not in a circle.